"The daily life of a new squad of rookies, halfway between a silver moon and a green-tinged planet"
Captain Jane Appet wants nothing more than to be a respected as an instructor in the venerated Orbital Academy. Every year she trains a new batch of rookies, but every year it seems her timid training style and bad reputation leave her without the respect she craves. When Captain Appet decides that this year will be different, it sparks off a series of adventures for her and her nine new rookies that she couldn't have possibly imagined. Orbital Academy has not been tagged yet. 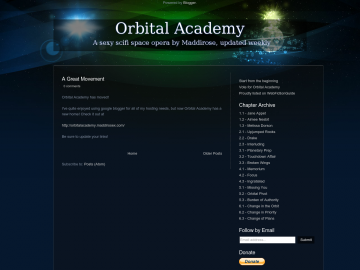 Help others find Orbital Academy by tagging it! Orbital Academy has not been reviewed yet. Orbital Academy has not been recommended yet.